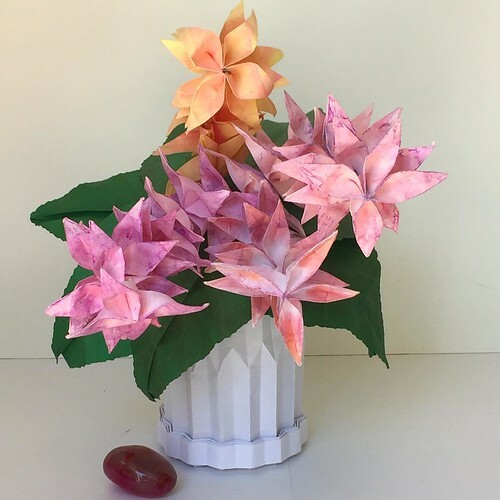 Origami flowers are well-done by many and origami vases are popular too, but Nicole Lopez Menendez of NLM Origami Passion in Westchester, New York is the first person I've come across who is putting them together in a seemingly endless variety of beautiful arrangements. What makes her designs even more special is the use of color-shaded papers that she creates herself. 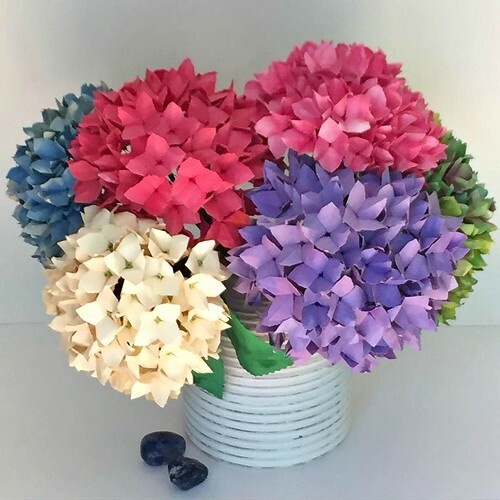 Just look at these realistic hydrangea blooms! 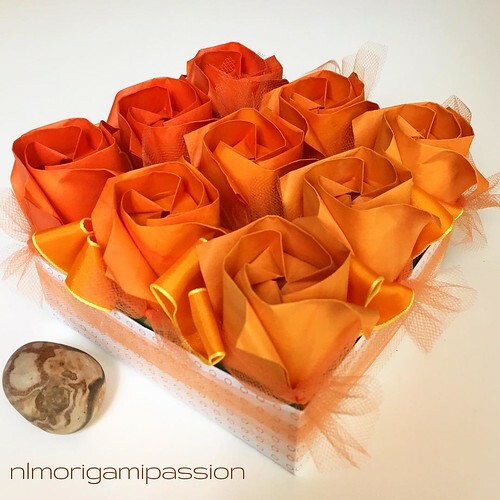 I came across Nicole's work on Instagram where she frequently posts new displays to her page, nlmorigamipassion, and wrote to ask her a few questions about her dedication to floral origami. 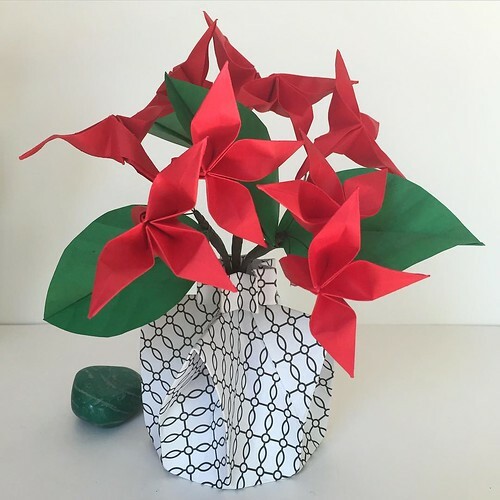 When and how did you learn to do origami? I have always been artistic and interested in arts and crafts and have worked in the fashion industry for many years. When my son started to get into sports I found myself suddenly having a lot of time on my hands waiting for him to finish his various sport lessons. To make use of that waiting time I started folding simple little animals following an easy origami booklet. The thought of creating something from a mere piece of paper fascinated me. I looked for something more useful to create from paper and that is how the flower idea was born. What do you love about origami? I love the combination of technique and design, the use of colors, and the endless possibilities a simple piece of paper provides. The folding also has a meditative aspect for me. I love that you design your own papers... tell us about them. Yes, mostly I design my own paper. I want the flowers to look as realistic as possible. 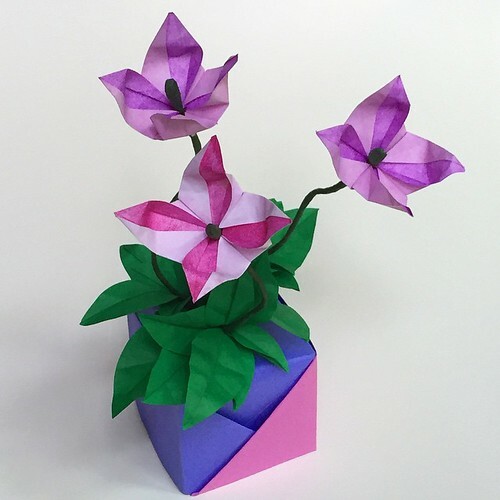 Regular origami paper usually is not as lively, kind of flat, and it doesn't come in enough shades to create a realistic image. So I started to create the shades that I needed. Before I create the matching tones, I study the real flower intensely. To color the paper I use various techniques. 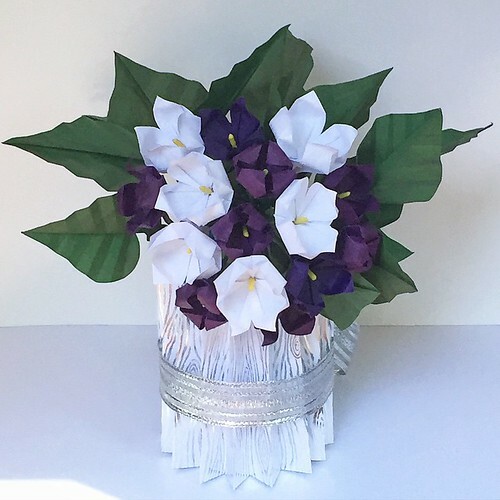 What started you on the path to making flower arrangements in folded paper vases? Each one is unique! My concept is to have a complete arrangement of flowers with vase. I just find that more appealing than having a bunch of flowers by themselves. In my eyes, the vase is very important in presenting my flowers. 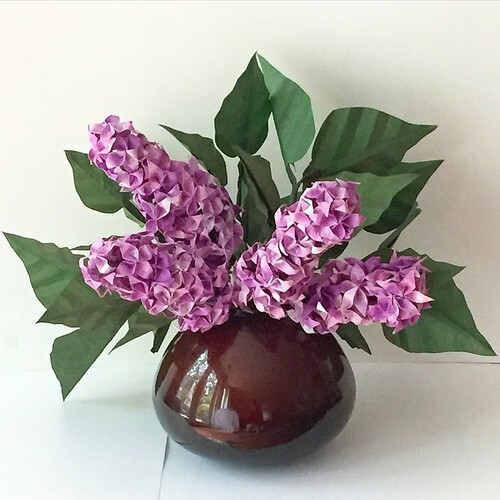 Every flower looks completely different depending on the vase it is presented in. It is not easy to find the right vase for a particular floral design. That's why I started to create my own. I am aiming to fulfill my design vision in each complete arrangement and am very pleased with my latest vase design. Its broad base but small opening provides stability for any kind of floral array. Do you do other types of art? Besides the florals, I am doing seasonal origami-inspired art work. I also used to sew, knit and crochet. How can people get in touch with you to purchase or commission an arrangement? My website is NLM Origami Passion. I just started featuring my work on various social media outlets. Besides Instagram, I have a Facebook page and I am on Flickr and Pinterest. I've done a couple of art shows and am planning on doing more fairs in the future. I have basically just started the business aspect of my art work and am looking for more marketing opportunities. Thanks Nicole! Best wishes with your new venture. Such lovely flowers! The lilacs are so realistic. And thanks for pointing me to the Little Circles Supply site. I'm glad you like the flowers, J.A. and you're welcome! Her vases are as beautiful as her flowers and they complement each other so well. I find when one finds passion in paper there seems to be no time for other crafts.